We had a fine sunny Spring day for our April meeting. Jim, Alisdair, Alistair, Andy, Gordon and Graham gathered at Simon's house in Glasgow. The occasion was the first viewing of Simon's recently-completed loft conversion, a vast, airy, sunny space which he plans to fill with various parts of the Mallaig Extension in BR days. A 2mm scale plan of Mallaig station covered part of the floor, and we were shown the start of the Glenfinnan station baseboard and detailed drawings of the well-known curved viaduct just south of that station. This project should keep Simon out of the pub for many years (or maybe it will drive him to spend more time there ...). We look forward to occasional progress reports. 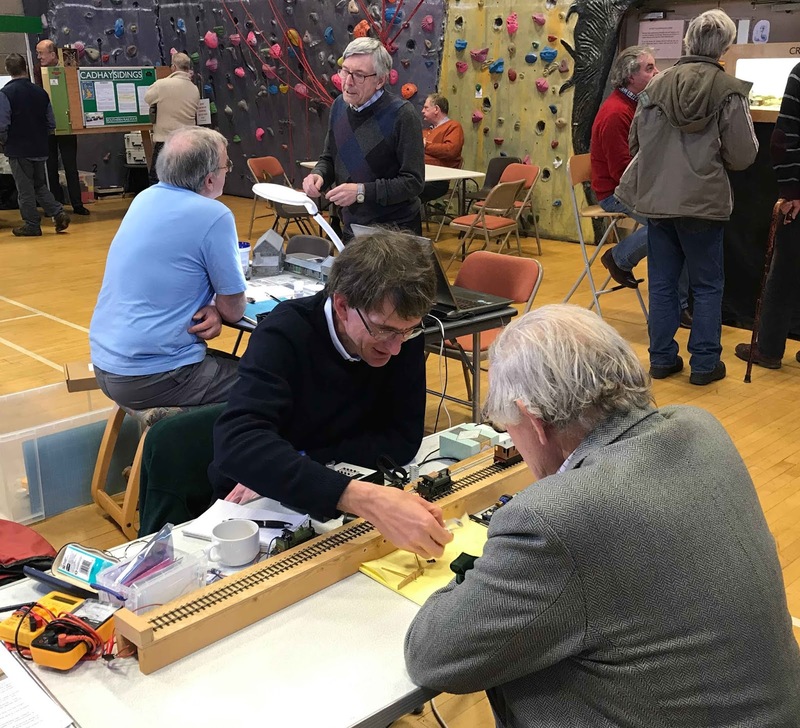 This month's Short Talk was by Jim, who explained how he'd made the signal wire pulley stakes and the telegraph poles for his Kirkallanmuir layout. He designed a fold-over etch for the signal wire stakes: in practice, the etch (on the right of the laptop screen below) proved insufficently sturdy to be removed from its fret, never mind built and installed. Not to be defeated, Jim adapted the etches using slices of 0.4mm copper wire as pulleys, and produced a workable design which he installed on Kirkallanmuir. He had brought a further set with him which he added to Sauchenford later in the day. 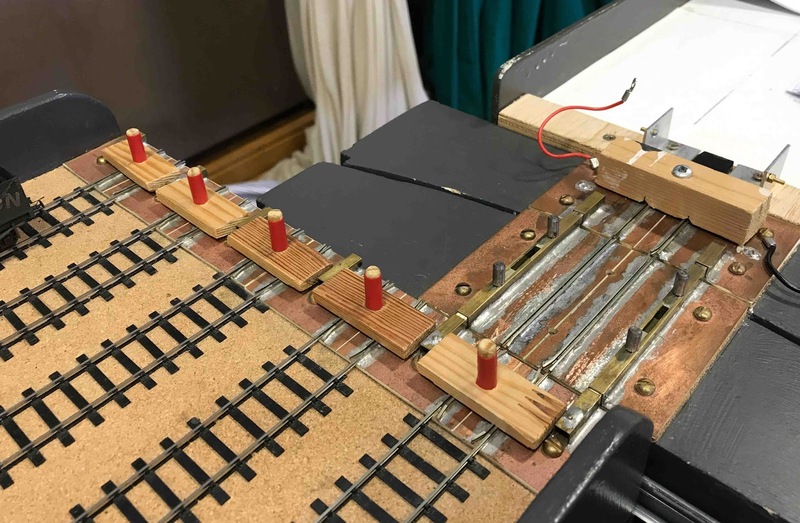 The characteristic Caledonian Railway A-frame telegraph poles were made from 1.5mm brass rod, tapered using sandpaper and a mini-drill (a suprisingly lengthy process: 10 or 15 minutes per post). Flats were filed at the top of the posts so they could marry to form the "A". The poles and etched cross-arms, again of Jim's own design, were assembled in a card jig made so the cross-arms could sit accurately and square to the posts while they were soldered up. The insulators includes detail like heavier-duty spindles to lead wires off to lineside cabinets and to signalboxes. A ring of wire at the base of each pole allows them to be easily located in baseboards and removed for transport and track cleaning. Jim sprayed them with black acrylic paint from a rattle can before touching up with dark brown paint, with a dab of slightly-let-down white for the insulators. 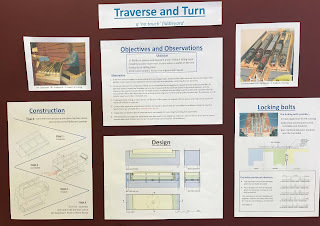 After Jim concluded his talk, we lunched on bacon rolls (Simon raised the bar slightly by adding seasoned tomato slices: it's these wee details that matter in the FCAG, and we will be interested to see the response from future hosts) and two kinds of cake. 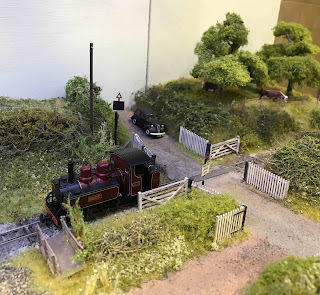 Then it was back to the layout room for Jim to install his signal wire stakes and Alistair to install a few more trees on Sauchenford, and for the rest of us to get on with etched kits and styrene sheet buildings. Jim, ever productive, made a start on another of his own etches for a Caley lattice footbridge for Dunallander (different from the last one). By the end of the afternoon he'd already completed one side of it. You can follow his progress with this model here. Thanks, Simon, for hosting us so spaciously (not that we're jealous or anything ... ). Next month we plan to meet in Edinburgh, at a venue to be confirmed. 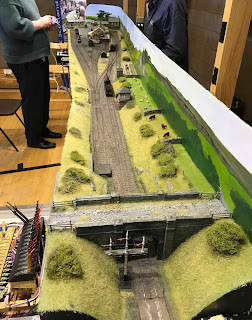 For a change this month we replaced our usual meeting with an outing to the Chris Kedgeley memorial Skills Day event organised jointly by the Scalefour and EM gauge societies, which took place this year in Linlithgow. Although the scale was 4mm rather than 2mm, there were plenty of interesting techniques to learn from, and some nice modelling to look at. Behind him at the other table can be seen Ian Lister, demonstrating how to create realistic stonework using Polycell Advanced Polyfilla, which he selected after trying 6 or 7 different products, since it has just the right amount of flexibility to take detail without flaking or clogging when scribed. Ian builds walls with this stuff by coating 30 thou plasticard with a 50/50 PVA/water solution then spreading on a thin, even coat of the Polyfilla with a steel artist's spatula. The PVA helps it bond. The mix is spread over the edges and left for 24 hours to set, then the edges are trimmed. Scribing is with a blunted point such as that from a compass (the kind you draw circles with, not the orienteering sort) held in a pin chuck. Patterns such as granite setts (cobblestones) can be gently pressed in using a tool made from brass channel. An old electric toothbrush makes a good orbital sander, used gently to remove crumbly edges and give a slight key before painting. Scrapings from artist's greytone pastels are used to weather the painted walls, and very effective the finished result looked ... so much so that I forgot to take any photos, so you will have take my word for it. 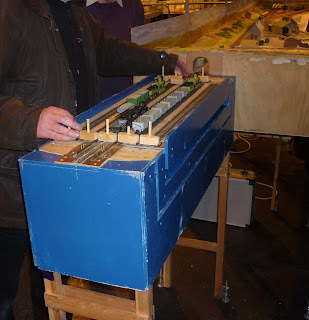 Ian modelled in 2FS for a while, writing up his achievements on RMWeb, before moving up to EM after his 2mm layout sadly did not survive a few years' loft storage. It was good to hear about his techniques at first hand. 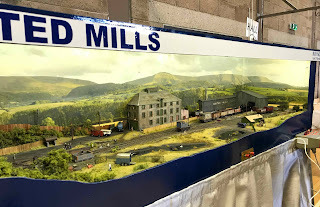 John had brought his P4 Midland Railway layout "Kettlewell" to Linlithgow, so here was a chance to see how the yard worked from up close. The design has a clever interlock to prevent the table being rotated if the sliding part is not centred. Full details are to be found in Scalefour News issue 178/179/180. Here are a few pictures. Above is the clever interlock. The turntable part has the exit track aligned by sliding bolts which are a snug fit in brass channels on each side of the gap. Tracks on the traversing part of the yard are aligned by further bolts in the same channel. However, the second set of bolts must be fully located into their corresponding sockets before the rotation bolts can be withdrawn - and the socket depths are arranged so that full location is only possible on the middle road. This prevents the table being rotated except when it is centrally aligned. John mentioned that he'd found a 1.3m long yard was perfectly feasible, but that it was necessary to strengthen the table so it did not twist. A 2mm scale table with this design seems perfectly feasible. 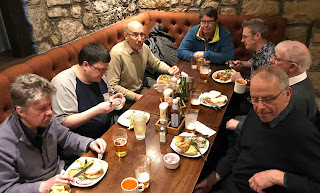 We broke off for a while to visit the "Four Marys" pub on Linlithgow High Street for lunch. 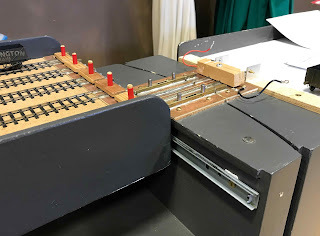 Kettlewell again, with a Scalefour Society mechanical lever frame modified to include a locking tray built from brass strip with the locks made from screwheads. I should have taken a detail photo but did not :-( but I expect it is to be found on t'Interwebby somewhere. You can just see it bottom left in this photo. There was plenty more, but I spent more time asking questions and gazing at layouts than taking photos. However, I hope this gives a flavour of what was, all in all, a very worthwhile day. Our thanks go to organisers Jim Summers and Dave Franks, who made our group very welcome, and of course to all the demonstrators and layout owners and operators. 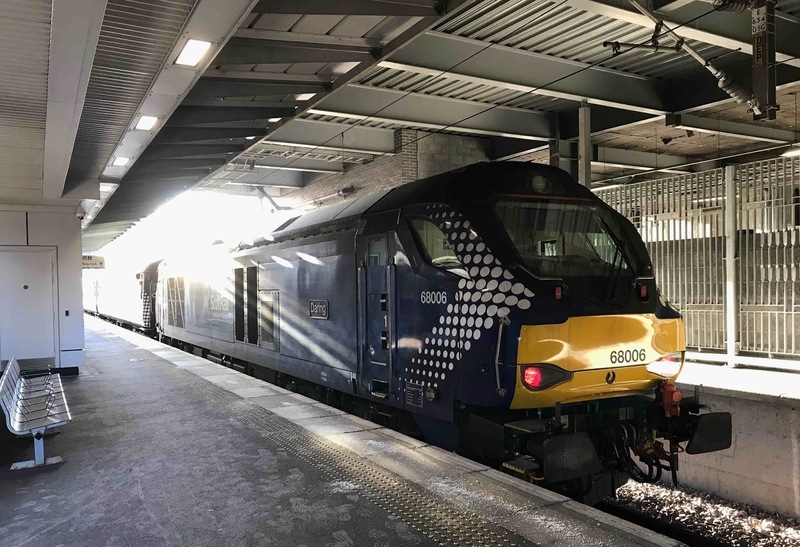 Finally after the short train ride back to Edinburgh, there was an added bonus in finding a loco-hauled train sitting in Platform 0 (the short bay on the Up side) at Haymarket. 68006 "Daring" and 68007 "Valiant" normally work a couple of suburban services, Monday to Friday only, round the Fife Circle. These turns involve far more miles as empty stock from their base at Mossend than in revenue service. This afternoon they were topping and tailing a rake of Mk3 stock, advertised as the 1800 service to Inverkeithing, just across the Forth Bridge. Scotrail does not normally afford such luxury to Fifers on Saturday afternoons, so I assume this was an extra train to handle the crowds from the Scotland-Wales rugby international just up the road at Murrayfield. Next month we'll be back in Glasgow for a regular FCAG meeting, and there'll be none of this heretical 4mm stuff! Alisdair, Alistair, Andy, Jim, Stephen Harold, Stephen Hawkins, Phil and Graham met at Chris's house in Edinburgh for our February get-together. In a slight change of format, Alisdair had sent out homework ahead of the meeting: everyone was enjoined to bring a current project or other talking-point with them as the basis for each to give a five-minute talk. Of course the inevitable happened and each five minutes turned into 20, so that we broke for lunch before we'd got through listening to even half of the presentations. Never mind, it was all good stuff, and there will be plenty material for a future meeting. 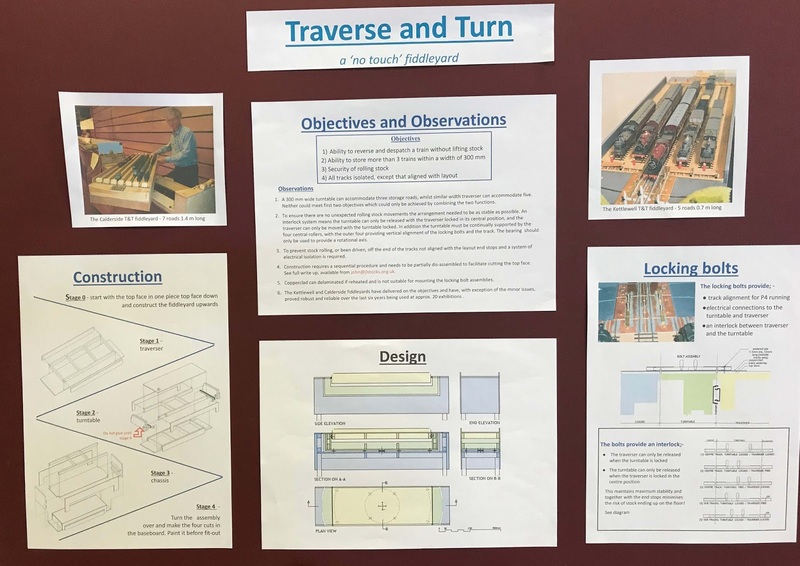 First up was Andy, who passed round the photos and plans he's collected for his chosen prototype, Aberdour station in Fife. He reckons he can get it into an 8-foot viewing section without any compression. 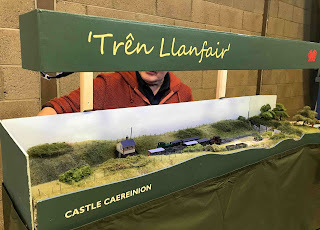 It's an attractive prototype, a station on a slight reverse curve with convenient overbridges at each end and a 11th-century ruined castle to one side. Maybe 2019 will be the year the model comes to life. Discussion centred on whether it would be better to straighten the station out to simplify turnout construction. The consensus was that, provided that turnouts were built methodically, with each stage in the proper order, and not moving to a subsequent stage before being 100% satisfied with the previous one, as well as ensuring closure rails lined up with the crossing vees correctly, there was no reason not to build curved turnouts using a Templot plan. Next to take the floor was Phil, who brought an ecumenical note to the meeting by talking about N gauge Finetrax points. He is in the process of building 46 of these as a customer order. He showed us the sintered crossing castings which look very neat. The moulded plastic base and chairs are from the same stable as the Easitrac parts familiar to 2mmSA members. Phil mentioned that it's easy to inadvertently snap the moulded chairs when trying to separate them from their sprues after threading them onto rail. He finds that very fine cutters specifically designed for sprue separation is the best solution - Xuron track cutters are too coarse - he uses Micromark cutters, I would guess these ones, although Micromark list a wide and tempting range of other cutters on their website. One of the challenges with Finetrax is attaching the operating mechanism to the tiebars, which are now of plain rather than copperclad glass-fibre strip, so that soldering a pin to the tiebar is not possible. Phil's customer only has 30mm depth below the baseboard, adding to the challenge of designing an effective operating mechanism. However, he appeared undaunted. 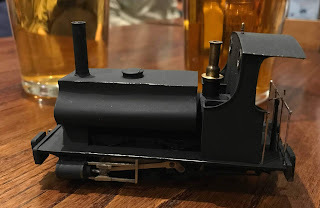 There was some discussion whether it still makes sense to adopt 2FS 1:152, 9.42mm gauge standards for a prototype which can be modelled with commercial 1:148, 9mm British N gauge rolling stock. Modern N wheel profiles are close to 2FS and the rail profile is the same, code 40 bullhead. 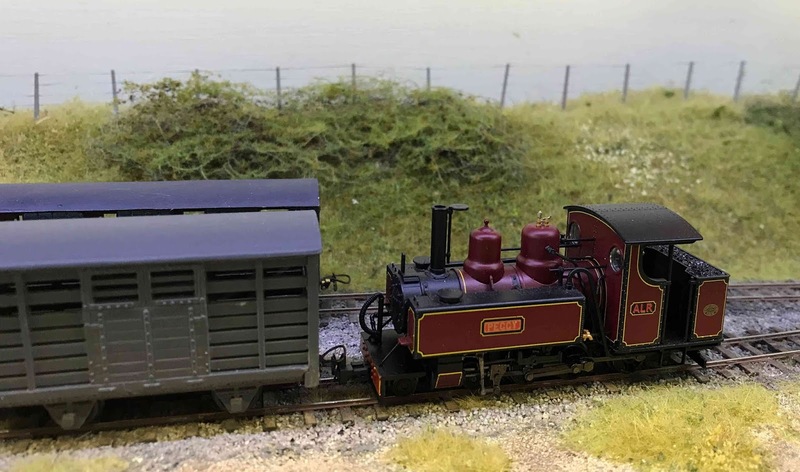 A gauge slightly narrower than scale and slightly-wider flangeways are perhaps compromises worth making in the interests of finishing a layout more quickly. 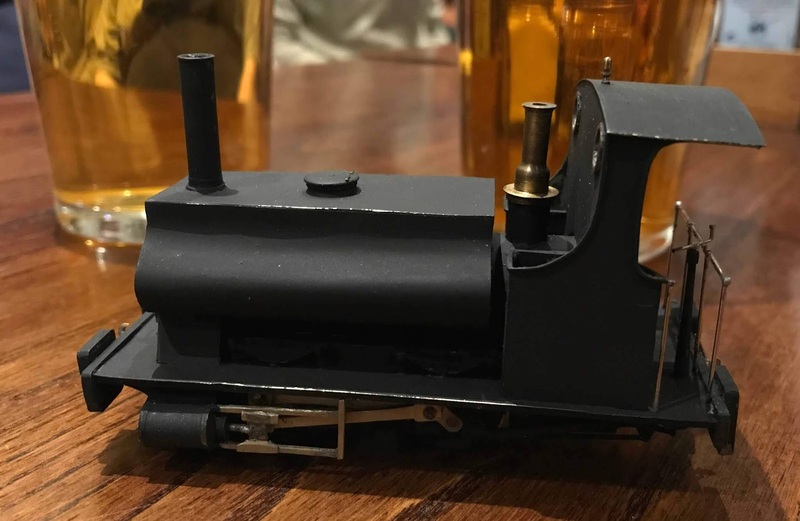 The Q5's weight is in a separate tube within the boiler so it could be moved to balance the loco correctly before being fixed in place. Steve's very neat soldering was remarked upon: the result, he told us, of using 145°C melting-point solder, which "wets" the metal better than 188°C due to lower surface tension. He uses the 188°C stuff when necessary for stronger joints or to ensure bits don't fall off. Phil revealed he prefers to silver-solder frames so they don't come to bits, holding the parts together with modified wooden clothes pegs, placing small shavings of solder on the joint, and using a microflame torch to fuse the solder. Another point of interest was Stephen's simple but effective frame to allow spray painting of a chassis, simply bent up from stiff wire. Jim took us through the design process of his current project, a lattice footbridge for the Grampian group's Dunallander project started by the late Neil Ballantine. The footbridge, the second one at the north end of Dunblane station, replaced a standard Caledonian Railway wooden design and probably dated from the 1920s (it was removed in the 1970s). 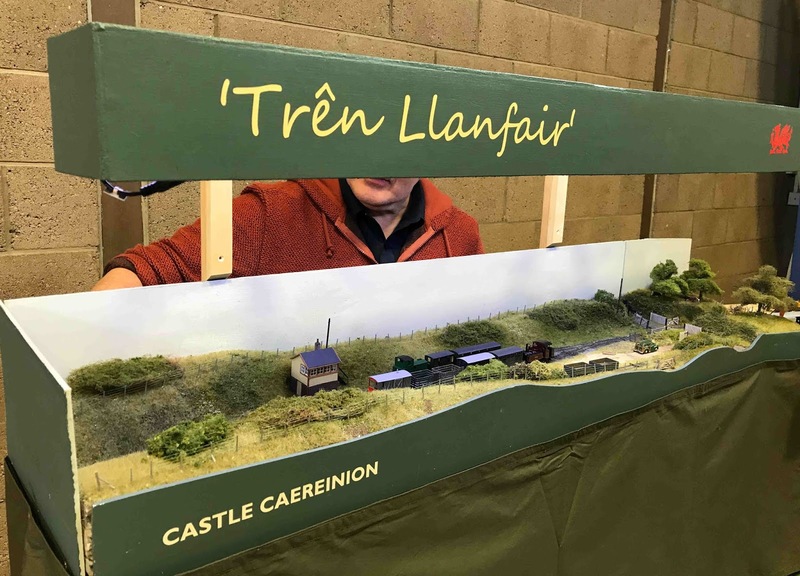 The original plans have not been uncovered, so Jim's design is based on the few available photos and a knowledge of Caley lattice bridge practice elsewhere, as well as detailed measurements of the site it has to fit on the layout. Not at all a simple matter, as he explained with the help of his laptop and Autocad. That was the end of the talks, since it was lunchtime. Chris served up his home-made soup and large stacks of bacon rolls. 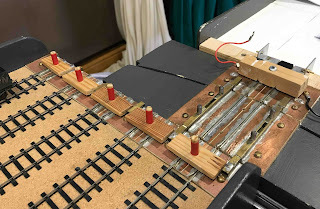 After lunch, we made a concerted effort to re-gauge and generally renovate Sauchenford's fiddle yard cassettes, made from aluminium angle "rails" screwed to a plywood strip base with styrene-sheet side walls. The decision to use small woodscrews to attach the angle to the ply was in retrospect a mistake, since they have not held their positions tightly enough and are forever going out of gauge after handling. The angles were carefully gauged and glued in place this time. We will see whether this works better in the long term. Before we finished up, Alisdair's Caley Jumbo (294 class) was given a quick airing. He recently drop-tested the model, chipping the chimney, but he gave it a quick swipe with a file and it seems little the worse. 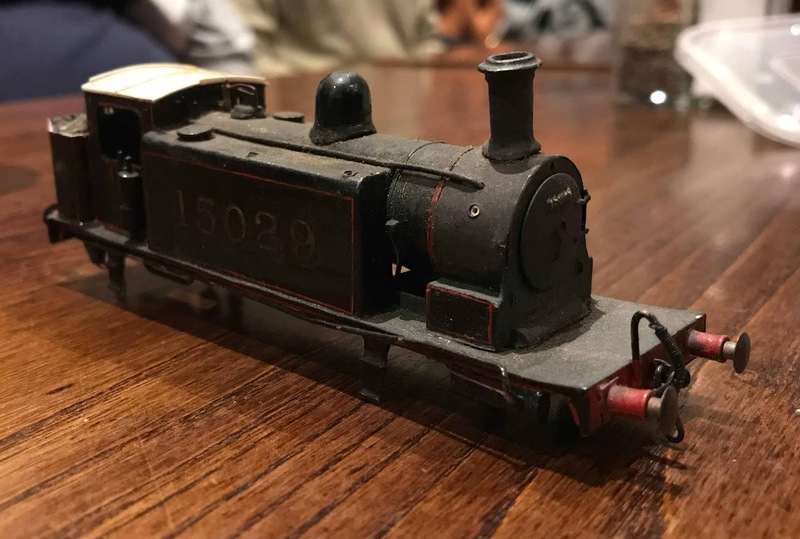 It looks quite the part of a loco at the end of its service life, with replacement lum (chimney), dome cover and safety-valves, wearing a class K (branch freight or ballast train) lamp to signify how far down the pecking-order it has fallen. (The chromed bull-bar sported on its buffer-beam is in fact an Electra coupling hook). Shortly before we finished up, Chris gave us a quick demo of his low-cost DCC system, based on an Arduino microcontroller with a Motorshield board to drive a 15V supply to the track. Just over £40 for these two, or half that if Chinese copies are used. Free open-source JMRI software is used to control the Arduino with Engine Driver software allowing a mobile phone to be used in place of a PC. Chris demo'd this working with his 4F, a design with enough space to hide the Zemo 622N chip (another £20) which Nigel Cliffe had recommended to him as a good option to dip a low-cost toe in the DCC water. The loco's controllability on his test track was most impressive - proof that DCC does not have to cost a fortune and that a low-cost trial is very feasible if you are curious to see if it suits you. The next group meeting will hopefully consist of a visit to the EM/S4 societies' Skills Day in Linlithgow in March to find out how things are done when you can actually see what you're modelling ... We will re-convene in Glasgow in April. Thanks Chris for top-class catering, and for tolerating our invasion of your household. 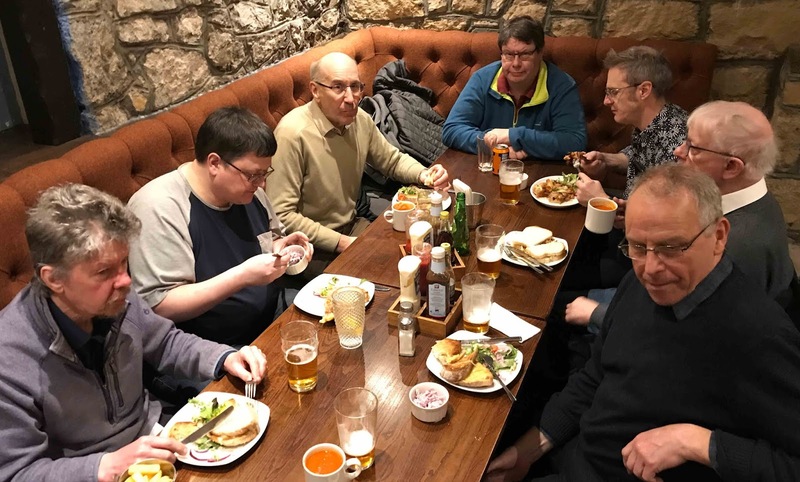 Alisdair, Alistair, Andy, Chris, Stephen Harold and long-time-dormant FCAG member Stephen Hawkins met at Graham's house for the first get-together of 2019. This month's Short Talk, by Stephen Harold, concerned his day job as a power controller at the DRS control office in Carlisle: ensuring that serviceable locos are available for scheduled workings and that scheduled maintenance is performed on time. We had an extensive explanation with many questions answered: thanks Stephen. There was quite a lot of "admin" discussion, now that the group is regularly six people or more it is less convenient than before to met at members' houses so we are investigating what alternatives might be available. If you know of premises we could use on a Saturday afternoon once every two months in either Edinburgh or Glasgow areas, do let Alisdair Campbell know. Sauchenford got a little more work on the fit of the cassettes in the fiddle yards. 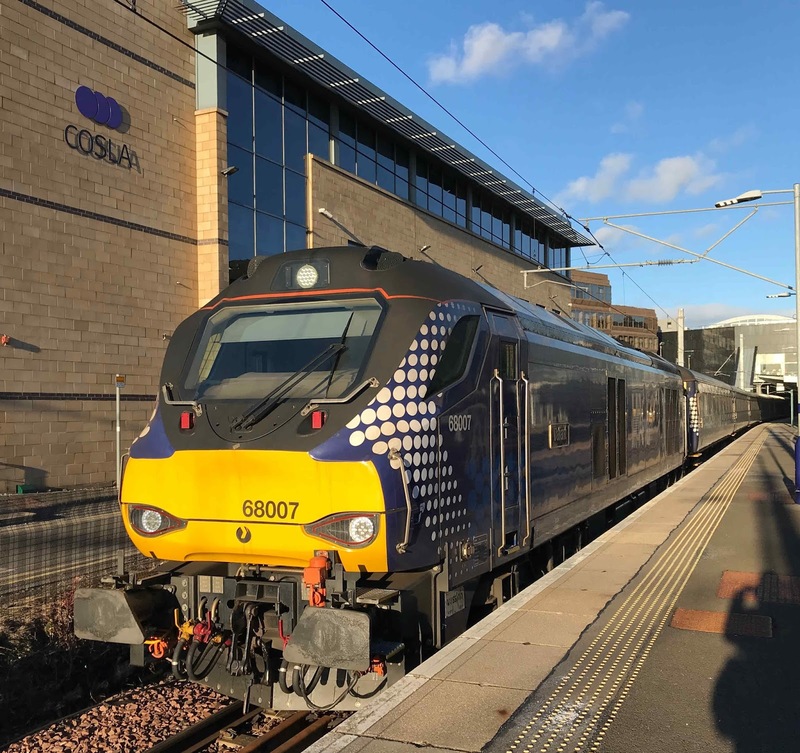 Some initial disappointment was seen when a test loco derailed consistently due to a hard-to-detect track fault. Eventually we realised there was no track fault: the bogie of the diesel loco was binding on the body and throwing it off the track at a slight curve! That was soon fixed, and we were a little further down the road of improved reliability. Next month's venue is not finalised and will be communicated by the usual e-mail to 2mm members within Scotland. 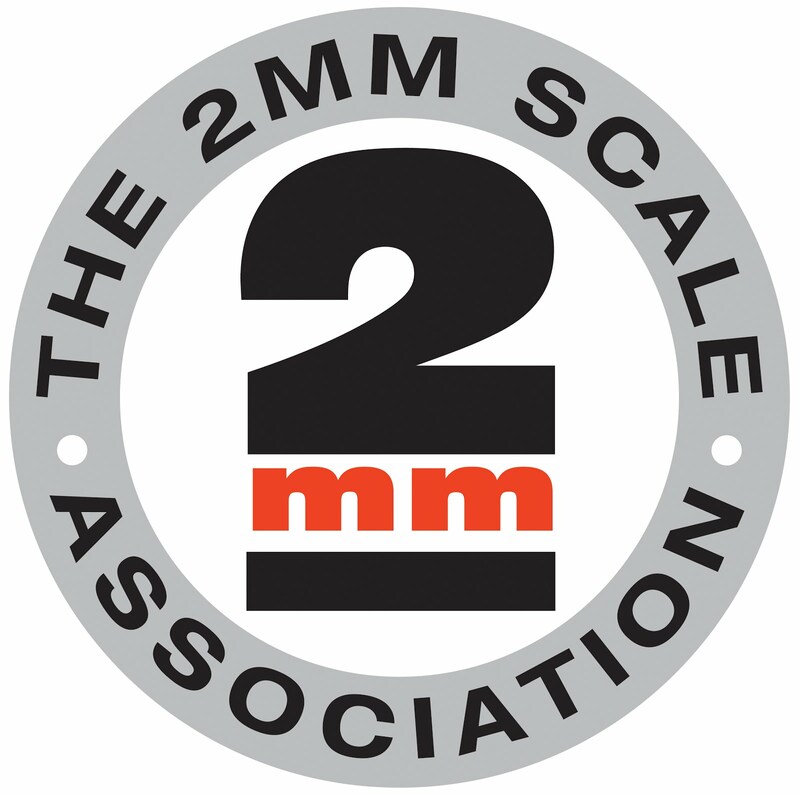 If you feel like coming along, or want to see what 2mm finescale looks like before joining the Association, just get in touch with Alisdair Campbell via the Data Officer contact mentioned here. 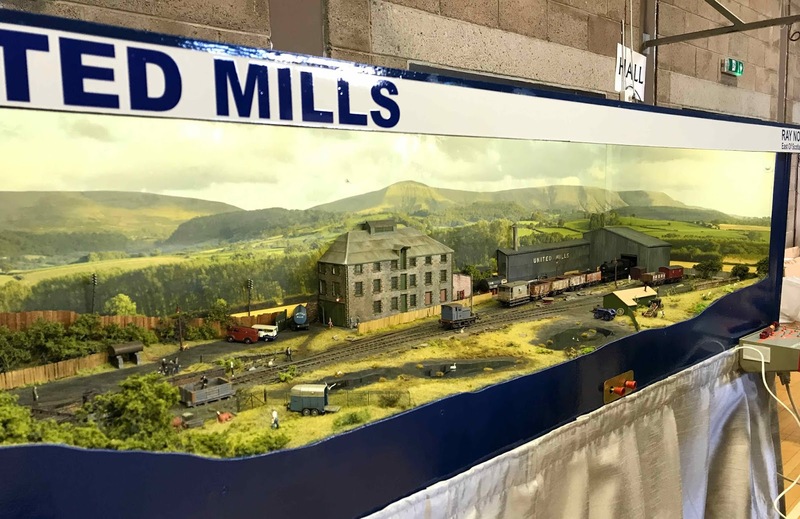 Or come to Model Rail Scotland on 22-24 February in Glasgow, where we'll be manning the 2mmSA stand.